I have to confess that this E-Zine has inspired me. More than anything, I wanted a place to share ideas about what can be accomplished with stencils. I love taking a piece of furniture or something that someone else is ready to throw on the trash heap and make it into a focal point or conversation piece of the room. I especially think it’s funny when I have to point out to them the item they discarded and sadly inform them that they cannot have it back. This month’s stencil project starts with a weathered old sea trunk that someone way back when decided to use a pickling paint technique to update. The object was to bring back some of the character of the piece. Before any stenciling could be done, the background had to be set. The strapping, corners, all the metal clasps and locks were painted black like it was originally. Those areas were carefully taped up with painter’s tape and the rest was spray painted a light tan color. When the spray paint dried, a sponge was used to dab a thick layer of light brown acrylic paint into each square taped off. While the paint was still very wet, a comb was used to run through it horizontally and then vertically. This created the appearance of a cloth covering like burlap, which was traditionally used to cover old sea trunks. Now, for the stencils! One of the designs from the Vintage Luggage Labels Category was painted in each squared off section. 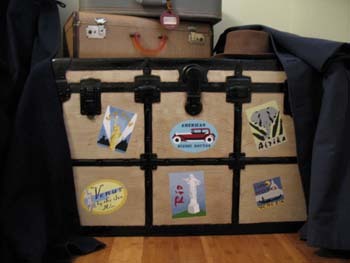 Of course this was not an easy task because there are 15 different Vintage Luggage Label Stencils but the effort was well worth it. Here is the finished project. 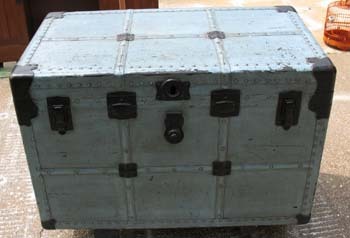 This unique trunk can be used as an end table or even a coffee table. It looks great with these old suitcases and the bowler hat. These old sea trunks can be found in Thrift Stores, Flea Markets and even on the curbside on trash day. If you run across one, now you’ll know just what to do with it. I hope you enjoyed this month’s project and if you decide to try it out please send me some photos. I would love to see them and share with all the other readers. Thank you so much and keep stenciling! P.S. By the way, the stencils used on this page came from Designs From Penny. You can get some great stenciling ideas and all the designs are downloadable so you'll get them right away!